Healthy eyes and good vision are paramount for independent and active living, at all ages. Yet, the role of vision on the wider policy agenda, from access to primary healthcare to road safety and healthy ageing, at both the national and the EU level, remains limited. Despite the growing awareness of the role of opticians and optometrists as primary care givers, there continue to be various opportunities to promote eye health across borders and to harmonise clinical and educational standards of optometric and optical practice throughout Europe. 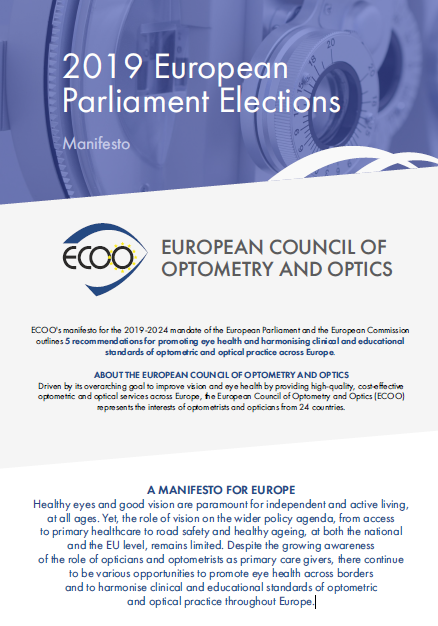 ECOO therefore launched a manifesto for the 2019-2024 mandate of the European Parliament and the European Commission, outlining 5 recommendations for promoting eye health and harmonising clinical and educational standards of optometric and optical practice across Europe.